Good morning – back to shorts and T-Shirt! Nice break, but drizzling and overcast for the day – Maybe some sun tomorrow. This is a very short post which is unusual for me, but I forgot to add my SLOW work on Stonefields in my previous post! There were 4 blocks in this Segment that I did not care for and replaced them with Mini-Dresden’s. I like the Fusions fabric and pleased with the way they turned out. I machine sewed the Mini’s and then hand appliqued them to the background squares. I am still not in the mood to do a lot of handwork in the evenings maybe the desire will come back as I progress through the maze of Flu and SI joint problems. Today I will be working on the remainder of Stonefields as we watch the football playoffs as I am so far behind on my applique projects. Tomorrow my Kaufman Premium Cotton will arrive and I can then begin on preparing Aunt Bea’s Parlor embroidery project I enlarged the pattern just to make sure I would not mess it up. Then that means adjustment to the entire quilt when adding the corners – good challenge for me! Have a great Sunday, hoping that winter is not over with yet here in South Texas. This entry was posted in Quilting and tagged Aunt Bea's Parlor, Stonefields. Bookmark the permalink. ← A 2018 Flimsy Finish – My Rainbow Regatta! Your Dresdens are so cute!! Fusions is my favorite line of fabrics, they’re so beautiful! I hope the fabric works out for Aunt Bea’s Parlor. Check the weave before you start, make sure it isn’t too tight for embroidery. Happy stitching! Thank you Gretchen! I wish I had more, maybe I will purchase some larger pieces. About 3 years ago I wanted to start with some EPP projects and bought a selection of fat eighths. Still have a nice little stash, but one cannot do a lot with fat eighths. On the Kona, I will be able to do that by just looking and if too tight it will be returned, of course it will cost me but that is the way it goes. I talked with them and Missouri Quilt people and they keep telling me that it is just a little bit closer weave and thread count. But we know how that goes! Those are such pretty colors, very rich and saturated! I love the block and hope you feel better. At least you can enjoy better weather for a while! The Dresdens are coming along. I love the Fusions line of fabric. 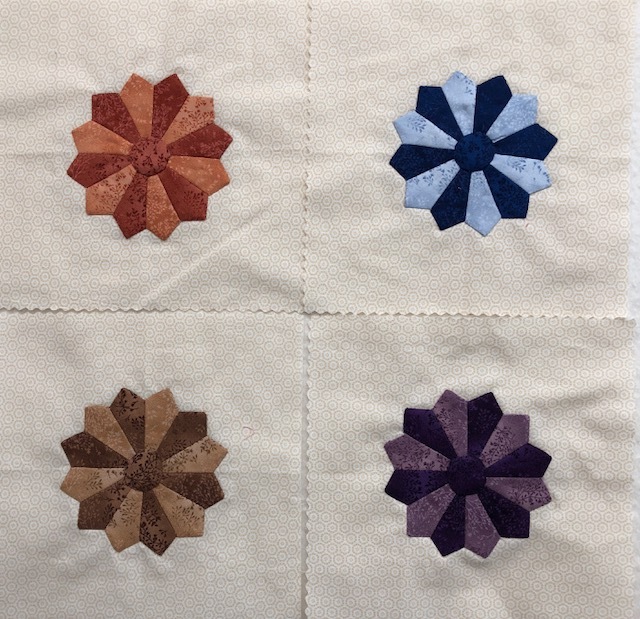 I used it for one of my stars quilts and fell in love with it. You sound like you are almost better. So good to hear it. Doing great today (Monday). Walked over 10,000 steps – morning walk and doing housework. Nice to be back. Worked that joint real good! I need to make some floor space and play with the Stonefield blocks to see where I want to place each one. I don’t want to trim them until ready to sew so that they have nice edges instead of strings all over. Because of fraying, I cut my blocks with pinking rotary cutter, then do a stay stitch – it cuts down on all strings on hand projects. I may square mine with the pinker blade to help with fraying. Although the P&B that I am using does not fray as bad as some fabrics. Have a great day and thx for commenting Karen. Take care!